So, here we are at the new blog. Obviously I got the idea for this from the Gems of the Week posts I did at Where the Lovely Things Are (and will continue to do here). I went with it because it was super-short & super-simple and I thought to myself: "There's no way you can get sick of this". Of course, you can get sick of ANYTHING: limonata is my favorite drink but after a couple (dozen?) cans I want something else. But I'll definitely be happy with it for at least a few years. I'm guessing. It took me a long time to make a blog name decision, though. First, I considered going the actual-name-as-blog-title route. You can't get sick of your own name! Well, you can - but it would be pretty damn hard to change it. In the end I decided against it, I'm going to be using this space to share the work of others: if the blog title was my own name it wouldn't make a lot of sense. Vetoed. The Aviary / Candy Castle - I like that these make the blog a place. "I found ____ over at The Aviary today". Anne Louise Likes - This is along the lines of the actual-name-as-blog-title thing, but with "likes" added on. I also enjoy that it's LITERAL. I like to be literal with my blog titles (see - Illustrated Ladies, Colorful Homes, etc.). But that was part of the WtLTA problem: I'd be asking myself, "Should I post this?!?! It isn't a 'lovely thing' though..... you can't post that, Mallory" I'm insane. Bonjour Johanna / Miss Moss - Name involved in the title in some way. Fancy Fine - Ashley does something interesting, because her blog title is Fancy Fine, but the web address is her actual name. So if she wanted to change Fancy Fine to something else she could do so SUPER-easily. Plus, Fancy Fine in and of itself is a nice title. All This Happiness / butter and brass / fieldguided / Length x Wit / oh, hello there / So on and so forth / thank you, ok / etc. - I like all these because they aren't literal. At all. The opposite of Where the Lovely Things Are. What will you find at a blog called thank you, ok? Who knows! Your content isn't dictated by your title. The end result of this process was a non-decision to name my blog "lobster". HA! I mean, I still think that would be kind of great. I love the word lobster and I love lobsters as creatures of the sea, but... it would be a rather strange. None of the other options passed the would-you-want-to-tell-someone-you-just-met-that-blog-title test though. Yeah, in the end I decided against lobster, but if I'd been out some night and talking to a guy who asked me if I had a blog and I answered - "Yes! Lobster!".... I would've been completely fine with that. My literal tendencies won out.... in an acceptable way. I'll never be reticent to admit that my blog is called Gems - it's too simple to be embarrassing. And it's literal because I plan to post "gems" here. Gems meaning awesome things and artwork and the such. But "gems" is more all-encompassing than "lovely" was. If I'm taking the time to post about something, I'll obviously consider it to be a gem, but I may not have necessarily classified it as "lovely". Blah blah blah. Is anyone still reading this? Once I decided on Gems the only issue was getting the url. Gems.com was taken, so was gemsblog.com and gems-blog.com. 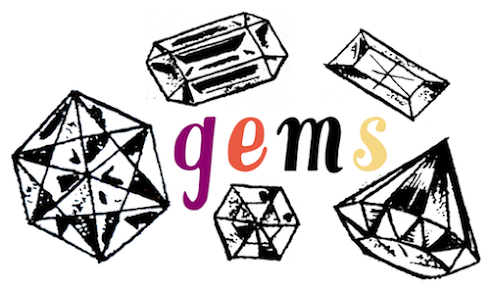 I thought about gemsgemsgems.com because that would make the process of typing the url almost like an incantation (when you finish typing a gem appears on your keyboard!) but even THAT was already claimed! To add another gems seemed excessive and I had no interest in having a .net or whatever, so that's how I got to lookatthesegems.com. Which makes the blog even more literal, but by the time I shelled out my 10 bucks to own the url for a year I didn't even care anymore. So here we are. And here we'll stay. Eventually this blog will be accompanied by another tumblr I'm going to use for more personal and/or writing-centric things (because those are the only sort of posts that don't fit within my obsessive adherence to my literal blog name - those posts wouldn't be "gem-y"). I'll be sure to let you know when I start that. Not that you'd necessarily care, but - maybe. I mean, this rambling was obviously SO ENTRANCING that the idea of a blog devoted to more of it must be exciting you! Right?!! Haaaaa. i love when you ramble. it's the best. it makes me feel all normal and stuff (cuz i ramble). hahaha I'm glad I'm not alone / you appreciate it. I love the new name! It seems so perfectly right for the posts you do. Looking forward to continuing to follow all of your finds - they truly are gems! I loved reading your delightful posts about what led to the name change etc! Thanks, Melissa! I return the hello & I'm happy to find someone else who shares my kid lit love! Now I'll go check out your blog. Do you have a "subscribe via email" option? Haha this post was fantastic. I love your ramblings and I agree, lobster would make a cool blog. Awesome! Awesome! Awesome! Love it! It's tough this blog naming business, I liken it to naming your baby (don't have one, but I'm guessing it would come close... hehe) I care! I love rambling, I want to see this tumblr of yours when it comes to fruition. Exciting!! thanks, allira! & i agree on the baby front. i'm obsessed with collecting names for future dogs. i have at least 50 names on a list, and it makes me sad to think i'll never have enough dogs to use them all on! i guess i'll have to get fish. Hah, I'm flattered and happy that you like my blog name because I've had many similar thoughts about changing it! In my mind I think of it as "length by width" instead of "by wit," and if I, the blog owner, can't say/think it as written, maybe it's not the right blog name for me? But I'm attached the "wit" part, so it stays for now. Unless I can think of another horrible pun. I loved reading this post, as well as the one you left on your previous blog explaining the move to this one. Your love of children's literature and the associated illustrators and artists was very meaningful to me, because, again, I have a very similar attachment that has only gotten stronger and more complex as I have gotten older. Ahh, it's seems like nearly every comment I leave here is along the lines of, "yes! me, too!" Names are important, as are ramblings, so I'm super looking forward to this ramble-centric tumblr. Thank you for your comment, Liza! I have such a love hate relationship with puns. I love them in (many) blog titles (like yours), but I loathe them when used in (most) real-life store titles. Particularly hair salons. And lots of times when I've mentioned / via-ed your blog in the past I've just called it Length by Width accidentally. I noticed that as I transferred some blog posts over to this blog. And I'm glad that SOMEONE will read the tumblr. Even if it's only you and perhaps 5 other people. well, I have to say that I'm a fan of your rambling, too. I've gone through phases of wanting to change my blog name. My problem is that nobody knows how to pronounce it, or when I meet someone new and they ask for my blog name, when I tell them, they always always always say, "What?" But I'm pretty sure I won't change it, because I'm too scared of losing followers and it will be torturous (as you know) to think of a new name. I love the new name! I know what you mean about the connotations of the word 'lovely'. It either sounds v posh or a bit twee to me. But I love your blog whatever it's called. I named mine quickly and randomly and now I sort of regret it, whenever I tell people what it's called I feel like it sounds slightly remedial in some way.